In a digital age where the economy and the business industry are highly competitive, maintaining your own business can be really tough. You may have all the ideas necessary for your small business to do well, but you lack the financial resources needed for your plan of action to take shape. How can a small-time entrepreneur with only limited cash generate revenue while being surrounded by business tycoons? This is where a viable alternative called Bartering comes into the picture. As an entrepreneur or a consumer, you may be wondering how the concept of bartering that seems like an archaic idea can actually help business transactions. The Bartering System was around centuries ago before the existence of paper money and coins. In this day and age of advanced technology, bartering has made a huge comeback. Barter exchange platforms on the internet involve trading goods and services without the use of cash. This method of swapping items and services have slowly become a practical solution to managing the cashflow and maintaining the stability of a business. In this article, you’ll get to see how the modern system of barter and trade can benefit future negotiations and finance management, most especially if a business is just starting off. 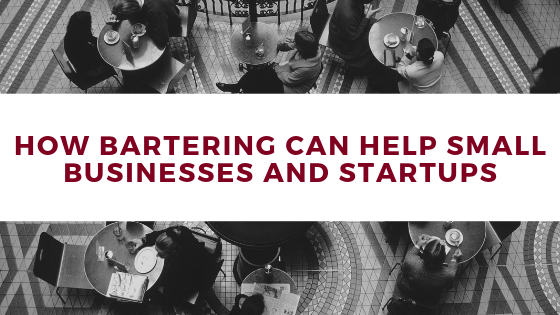 According to Jared Krause, CEO of a bartering platform named Currency, “Bartering makes a huge difference in the daily lives of small business owners.” The top priority of every business is generating as much income as possible. Bartering can be considered as a supplement to the cash flow of a startup. For example, instead of producing cash to purchase a newer and more technologically advanced set of desktop computers for a computer shop, an owner can trade his expertise as a computer engineer to another entrepreneur or organization. This way, he gets to expand his business without having to shell out a big amount of money. Since bartering occurs between two people or organizations, startups get to increase their professional network whenever they engage in well-organized and established bartering platforms or make bartering transactions personally. Expanding the business linkage jump-starts an organization and paves the way for prospective clients and partnerships that will surely help in future business endeavors. At times when a new business meets unanticipated expenses, it has a tendency to run out of money. Bartering helps prevent business disasters from happening since it allows owners to acquire what they badly need even at a moment when there is limited cash on hand. For example, if your carwash business is a registered member of online exchange sites, you can offer your services to another member in exchange for a new set of tools you need. This way, you get what your company needs at the moment without pulling out bills or swiping a credit card. Bartering has been around for thousands of years and it has now taken a modern spin to suit the needs and lifestyle of consumers and entrepreneurs. The contemporary barter method also proves to be great alternative for small businesses and startups with limited financial resources up to this day.